Vacuum carpets before extraction; this can result in less water and solution needed to clean them. If prespraying carpets, prespray in moderation, concentrating on problem and high-traffic areas; some carpet cleaning chemicals contain alcohol or petroleum that can cause carpets to stay wet longer. In the winter, turn up the heat; in summer, turn up the air-conditioning; look for ways to keep air circulating. If the room has a lot of movable contents, extract the center first and then move contents to the center of the room and extract the perimeter, placing blocks under furniture legs. Leave contents in the center of the room as long as possible to allow perimeter areas to dry. The extraction hose should be the largest diameter approved for the tool and the extractor; use the shortest length possible as air flow decreases with hose length. Avoid loops or bends in the hose. Select wands that atomize the extraction process; this minimizes the amount of water left in the carpet. Place air movers (blowers) at 45-degree angles to the floor to ensure the air blows over the carpet, not down onto the carpet. Install one air mover for every 15 feet of carpet cleaned. Select “low-amp” air movers to avoid power blowouts. The healing hands of a healthcare professional too often bear the risk of spreading infection while administering care. According to the Centers for Disease Control and Prevention (CDC), failure to engage in proper hand hygiene is the leading cause of healthcare-associated infections and the spread of multidrug-resistant organisms (MDROs), including vancomycin-resistant Enterococcus (VRE), methicillin-resistant Staphylococcus aureus (MRSA) and Clostridium difficile. Unfortunately, proper hand hygiene can be easily forgotten by busy healthcare workers. A study of 2,834 opportunities for hand hygiene found that hands were cleansed only 48 percent of the time, according to a World Health Organization (WHO) report (2009). Some programmatic changes can be implemented on one unit to help a hospital see what kind of reminders — such as posters near sinks, –work best for their hospital, Jacobsen says. Starting small can also help the hospital identify the factors particular to their work environment that prevent healthcare workers from practicing good hand hygiene, she adds. “The hospital would look at their own local environment because not the same thing is going to work in every single organization,” Jacobsen says. The WHO reports indicates that a lack of time, insufficient or inconveniently located sinks and irritated hands as some reasons healthcare professionals give for not engaging in hand hygiene. According to the 2009 WHO report, working as a doctor or nursing assistant was associated with a lower rate of compliance. In addition, working in intensive care, surgical care, and emergency care was associated with poor hand hygiene. Understaffing and overcrowding also contributed to low compliance, according to the report. Keeping positive data visible can be a powerful technique in encouraging staff to work together to create a culture in which best practices are the priority, Jacobsen says. “Not all infections are totally preventable, but many of them are, and just keeping that kind of information visible to people in their staff lounge − for example, to say it’s been 20 days since an infection. Again, it engages everybody as a team,” she says. Hand hygiene should also be practiced after touching wound dressings and before handling medication or preparing food. Hand hygiene is also needed before putting on gloves to insert an invasive device, such as a catheter. After removing sterile or non-sterile gloves, hand hygiene should also be practiced. The CDC says that bacteria linger on the hands of healthcare workers after they remove gloves. It is thought pathogens penetrate glove defects or hands get contaminated when healthcare workers remove their gloves. Depending on the procedure, hand hygiene is also recommended before wearing gloves. – Wash with soap and water after using the restroom, before eating and when hands are visibly contaminated. It is also recommended when multi-resistant spores are present. The mechanical friction of handwashing helps remove the spores and should be practiced in conjunction with wearing gloves. Medicated soap does make a difference in this case. – Pat hands dry using paper towels or use hand driers to reduce the risk of recontamination. Patting hands dry reduces hand irritation. Hand dryers should dry hands quickly without aerosolizing pathogens. – Use a paper towel to turn off the tap to avoid recontamination. – Use alcohol-based handrubs for hand hygiene at every other hand hygiene opportunity when handwashing is not recommended. – Use a palm full of alcohol handrub and cover hands completely. Rub hands until dry, this should last between 20 seconds to 40 seconds. If it takes less than 15 seconds you should use more of the product. Mary Shinn is a writer for ICT. 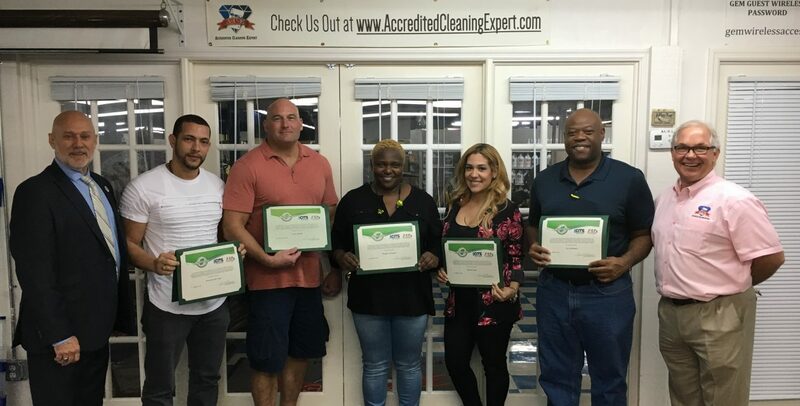 Train and re-train housekeepers (custodial staff) that their role is NOT cleaning for appearance sake, but for “health’s sake.” For too long we have judged the cleanliness of surfaces based on a shiny floor, smudge-free glass, spot-free carpet and a clean nice smelling rest room. The indoor environmental surfaces can be clean, but unhealthy or unsanitary. BUT, if those same surfaces are healthy and sanitary, THEY ARE CLEAN! There is a science to cleaning and disinfecting. The Environmental Services (ES) staff performs both the a.) Clinical function of removing and inactivating/killing HAI producing microbes, and, b.) The practical function of cleaning by restoring the room to order after soil removal activities are completed. The time has come to turn cleaning professionals into Hygiene Specialists (trade marked by UMF PerfectClean). Moreover, infection prevention will only become a reality when the hygiene specialist is properly regarded, educated and equipped. The hygiene specialist must be: a) Well trained and coached; b) Equipped with the necessary tools to clean, sanitize and/or disinfect; c) Allotted time to do the necessary tasks; d) Provided the tools to enable scientific measurement of “clean”; e) Educated about the prevention and transmission of disease. As a supplier and distributor of “cleaning” solutions we are always amazed at the passion our customer base has for their profession. We are looking forward to blogging our shared passion of cleaning and contributing innovated solutions in all facilities and organization we touch. More to come! Cold and flu season is upon us. Is your child’s school clean enough to prevent the spread of those germs? Watch as Bill Balek, ISSA’s director of legislative and environmental services, discusses the importance of cleaning and disinfection during the Health Watch news segment on CBS affiliate WDJT-TV. In this clip, he also explains how looks can be deceiving, when it comes to cleanliness.